Our Texas certified real estate appraisers provide residential and commercial appraisal services throughout the Huffman area for both private use and lending applications. Our philosophy is to deliver a fast, accurate and comprehensive appraisal service that meets our clients expectations exactly. Our appraisal fees are highly competitive and we take pride in maintaining some of the fastest report turn times in the area. We only employ appraisers that are local to the Houston area and familiar with its various markets. Our staff is capable of performing assignments for residential, commercial or mixed-use properties. If you have a commercial property assignment, most our Texas Certified General appraisers hold the MAI designation from the Appraisal Institute and are available across a large portion of South East Texas. Getting in touch takes minutes! 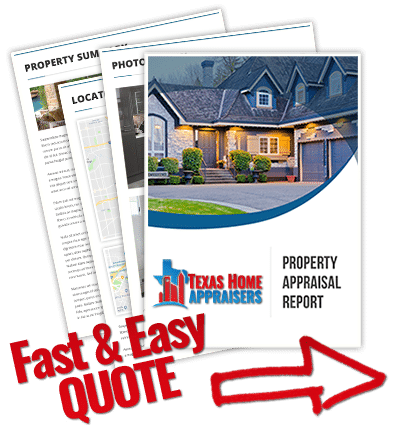 Just submit the online quote request form or call our number above and one of our certified home appraisers in Houston Texas will be standing by to help you with your project. Frankly, it’s apples and oranges. A CMA will most be comprised of a market comparison approach. For residential property an appraiser will also rely heavily on comparable properties, but the level of research and adjustments to each sale are much more in depth. Land and building prices are also important in an appraisal. A CMA delivers a “ball park figure”, an appraisal delivers a defensible and carefully documented opinion of value. Perhaps the most important factor to consider is the professional creating the report. Realtors are not required to have market area competence or knowledge or home valuation to create CMAs. Unlike agents, an appraiser must possess explicit market area knowledge when performing an appraisal. Realtors are also tempted to indicate a property value that they feel meets the homeowners expectations in order to secure a listing. Appraiser’s have no interest in the value of the property since they are paid a flat fee. Highest and best use is typically the usage for a property that will return the greatest value. For a highest and best use to be acceptable it must be legally permissible, physically possible, and adequately supported when all legal and probable alternatives are considered. The appraisal process is an orderly and concise method of reaching an estimate of value. There are multiple phases of research an appraiser must complete to determine a value. Common to most all appraisals is the determination of applicable approaches to value which include Market Data, Cost and Income. All approaches which are utilized are reconciled and deduced down to a single estimate of value which represents the most likely value for the property. Residential appraisal reports usually rely heavily on the market data approach to value as the most applicable. Is it a bad thing if the appraisal is higher than the sales price? A lender’s Loan To Value (LTV) is determined by the LESSOR of the sales price or the appraised value. It would only impact you if the value came in lower than your sales price because now your loan number would need to be re-worked. The good news is that you now have built in equity in the home. The only people that will see the appraisal are you and the lender so the seller will never know the appraised value was higher.